Ernest Borgnine died on 9th July. 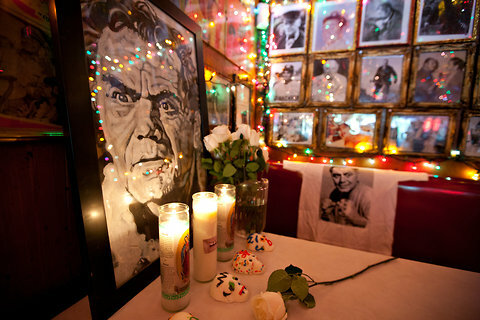 At his booth in Tortilla Flats, a Tex-Mex joint in New York’s West Village, they’ve put up a memorial shrine. Drunkenly, my date and I used poster paints, glitter and glue to liven up photocopies of Ernest’s face before the bingo caller ordered everyone to toast the aged star (“Here’s to another 95 for Mr. Borgnine!”). You can see my latest piece, commemorating the great man, over at the Cultural Gutter, a Canadian website devoted to disreputable art.